All items purchased are sold subject to use in compliance with manufacturers instructions which are clearly marked on the items. All products are suitable for use by non-professionals. Where advice is sought via our e mail or telephone service, the advice given is solely with regard to the product in connection with it's use for flies and flying insects and we do not accept responsibility for mis-use or handling. By ordering from our web site or by telephone, you are accepting in full, the terms and conditions laid out on the web site. 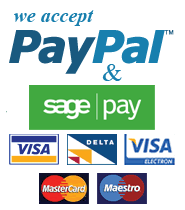 Our online credit/debit card facility is provided by Sagepay, a leading state of the art secure online payment provider, as well as Paypal. If however you prefer to order by telephone, we will be pleased to take your order. Please phone us on 0044 3330 113197 if calling from France or 03330 113197 if calling from the UK. Where possible, orders will be sent out the same day as being received, for delivery to France which normally takes about 5 days. We cannot, however guarantee this and you should allow 10 days for your order to reach you. If you are having products delivered to a UK address, these will be sent on a next day or 1st class recorded service. We cannot, however guarantee this and you should allow 5 days for your order to reach you. Where items are out of stock, we will notify you by e mail. Delivery charge to all areas of Frane is £14.99 and £7.99 to mainland UK excluding the Highlands of Scotland. Orders outside our normal delivery charge area such as Northern Ireland, Scottish Highlands, offshore islands and other countries will depend on weight and destination. Please phone for a delivery cost in these areas. In some instances we may subsidise carriage depending on value of order. Please note that any returns from subsidised orders will be refunded less the correct delivery charge and not the subsidised charge. Proof of our couriers charge will be provided on request. If you require orders to be left without a signature and left in a 'safe" place, we can do so but the responsibility of safe receipt of the goods passes to you and no claims of non-delivery will be accepted. If the order is incomplete, the customer must notify us within 10 days of receipt of the order. If the order is damaged, we must be notified us within 48 hours of receipt. Unwanted items may be returned for a full refund of the product price (excluding delivery charge) where the item/s are returned unopened and in the original packaging, within 14 days of receipt. A returns date and number must be obtained from us prior to sending the item/s back. The customer will be responsible for the return cost of the item/s. For your security, please send on a recorded service. Claims for items sent but not received at our returns address will not be accepted.